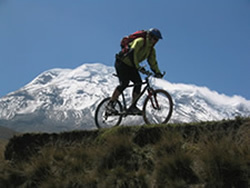 Home Ecuador Riobamba, licensed tour operator organizes first-class Mountain Bike tours to Chimborazo, lakes, indigenous, historic and culture sights. Mountain Biking Chimborazo Province reveals the most andean of all ecuadorean provinces with the largest, most dense indigenous population and the highest and widest mountain ranges in Ecuador. Thus its capital, Riobamba, at the geographic center of Ecuador, is historically known as The Sultan of the Andes and the Heart of the Fatherland. 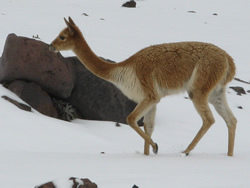 We offer excursions to Chimborazo and other snowpeaks, mountain lakes, thermal pools, rain and cloud forests and indigenous, historic and cultural sites that reveal unimagined natural and cultural wonders hidden to the common tourist. Following you can see only a small sample of what Ciclotur offers. We offer trips to a variety of interesting places. For the majority of these trips a support vehicle is not essential (it is optional) and our office could be the starting point. But for distant places like Chimborazo (2000 meters climb), Guamote or Santa Fe de Galán a support vehicle is required. These trips are for adventurous tourists seeking less touristic places far from Riobamba. In addition to biking equipment and support vehicle we provide food, lodging, camping equipment and all that is needed for your confort. Considering aspects like distance, type of terrain, acclimatization, vertical profile of the route and physical fitness of participants, we design our trips for bikers of three levels: beginner, intermediate and advanced. Beginner Level: Adequate for those who ride bikes occasionally, that is less than once or twice a month. Intermediate Level: For persons who use a bike frecuently, as a means of transport or recreationally at least once or twice a week. Advanced Level: For those who practice mountain biking frequently and enjoy strong climbs, long downhills and technical paths. In our office we will gladly make a description of our tours using photographs, detailed maps and altitude profiles so you will have a clear idea of what we offer.